On our way over to Zingerman's, I stopped a chick, who was carrying what looked like a massive S'More on a plate. "Excuse me," I said, ever so politely and calmly. She jumped a mile and looked daggers at me. "Where did you get that?" I asked, gesturing at her plate of chocolate and marshmallow goo. With as few words as possible, she told me where to find Charles Chocolates stand and the S'Mores before backing away from us. Seriously? Did I look so hungry and desperate that she was afraid big pregnant lady was going to steal her food? As it turns out, it wasn't just me being pregnant. There was an undercurrent of fear and hunger that ran through the event. A plate of food went by and people who were still in line made jokes (at least I think they were jokes) about grabbing the passing food. I also remembered all the scam artists we had encountered and forgave her irrational reaction to my simple question. When I carried two S'Mores plates back to where Rachel waited in the Bacon and BLT line at Zingerman's, I found myself shielding the plates with my body, since every line I passed through resulted in, "Ooh, whatcha got there, honey?" or "Hey, where'd she get that?!" As I said, an undercurrent of fear and hunger. Speaking of that Zingerman's line, when I got back with our S'Mores, Rachel had moved two inches. I explained that the Charles Chocolates people had a computer meltdown and could take only cash. I suggested I finish my S'More, which was AWESOME, and then go suss out where to get the money back from my wristband. See, at this point, we were pretty certain we'd simply get our our BLTs and quit the joint. I stood in a few more lines and asked a few more event people for help before finally going back to Rachel utterly confused about how to get the wristband money back. All this time? Rachel had moved about one foot in the Zingerman's line. We decided to give up and call it a day. I gave up my dream of finally meeting Ari Weinzweig and telling him all about my life and Zingerman's and the University of Michigan. We gave up our dream of a BLT. Rachel gave up her dream of saying hi to the Zingerman's cheese guy. Clearly, the people running the Zingerman's booth had no time for idle chit-chat, anyway. We decided if we could get that money back, we'd really be okay with not getting back $10 on our wristbands. We got in yet another line and didn't even stand there for very long before a Shoreline staffer came down the line and collected our ticket print-outs, telling us we were just standing in line for a Xerox machine, and if we all had copies of our tickets at home, we could just leave. Cool! Next, we flagged down another Shoreline staffer and asked if he could please shed some light on the wristband refund situation. He paused and looked us over kindly before saying very deliberately, "Well, now, that's a question to which the answer remains to be seen. Let me try to get an answer for you." Rachel and I giggled, and I squelched a desire to respond in kind, "Do or do not, there is no try." As we waited for him to get an answer from The Force, we knowingly asked how his day was going. He sighed and smiled, "You know. I love food. But I don't love it this much!" Indeed. Our Yoda-like friend got his answer over his earpiece and, since we were now ticketless, he personally conducted us back into the amphitheater. He pointed to the place where we originally put the cash on the wristbands and said, "Can I trust you guys to leave immediately after this?" "Oh, my god, yes!" we said, a little too enthusiastically. He smiled sympathetically and left us. Easy as pie with the shortest line of the day, we got our money back. We didn't even need to say anything to the woman behind the counter. "Put your wristband on the scanner," she instructed. "Oh, you know why we're here?" I asked. "I know why you're here," she said, all tired out. We got our cash and collapsed on shady benches outside the amphitheater to wait for Dr. Mathra's pick-up. We had been laughing all day at how we inadvertently snuck in, and the lines, and the crowds, and the undercurrent of fear and murder and hunger, and we now laughed some more. People were leaving in droves, yet others were still arriving. "Run away! Run away!" I said, only half trying to keep my voice quiet. Rachel and I then decided that we weren't a very good Welcome Wagon. In fact, we were being the UnWelcome Wagon or the You'll Thank Me Later Wagon. We had our money back -- something I wasn't even sure we fully deserved since we had gotten at least one plate of free food out of it and had also gotten, as Dr. Mathra later said to high hilarity, "the priviledge of walking around the grounds -- so we decided we should keep our snark to ourselves and just go home. We couldn't WAIT to tell Dr. Mathra all about our adventure. Except that it wasn't over yet. We got home, put our feet up, started hydrating, and discovered all the Tweets coming in from friends and cohorts, who were still at the Fest. Clearly, everyone was upset, pissed, hungry, tired, and hot. We read each new Tweet with indefatigable interest and, punchy with the experience, stared Tweeting some really bad naming puns: "Screw up of Slow Food Nation proportions," "What a gastrophe," "Screw up of epicurean proportions," "Great American Food and Music FestiFAIL," "Epicurean FAIL," and "Katz-tastrophe." We kept laughing how I, pregnant and two weeks from my due date, still managed to have more fun than those in more comfortable shoes. I credit my cheesy companion for that feat. After all, I also kept scaring her about going in labor while we waited for our refund: "My water broke! NOW GIVE ME MY DAMN REFUND!" A few hours later, Rachel and hugged each other goodbye, and she had one last thing to say to me, "If your water breaks when I'm on my way home, I'm turning right around and coming back!" Ha-ha! Well, it didn't break on her way home, but it broke a few hours after that. Right around the time she Tweeted to me that she was unable to eat any more food, since her pastrami and chocolate-filled stomach was still mad at her and I Tweeted back that I was having a Pop-Tart, my water broke. Two days later, we had our refund from the event, and Henry William was born twelve days early. I guess he just couldn't wait to have his own Katz pastrami sandwich. So, while the Great American Food and Music Fest might have been a major mess for many, it gave us one hell of a birth story. 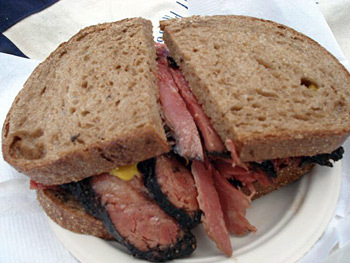 With a life and career that revolves around food, you can't do much better than going into labor because of a food fest, a S'More, and a pastrami sandwich. That laminated menu is so going in Henry's baby book!